The Cold Spray is based on the discovery (made in 1980s) that particles moving at supersonic speed adhere to a surface after collision. The DYMET® has received the name «Low Pressure Cold Spray» (LPSC). – use of low-temperature compressed air as the working gas medium. – use of a mixture of metal and ceramic particles in deposition, as a rule. – introduction of powder material into the supersonic nozzle after its critical section. The technology allows deposition of coatings onto metal, ceramic, glass, stone, and concrete substrates. Currently, DYMET® coatings can consist of aluminum, zinc, copper, tin, lead, babbit alloy, nickel, and other metals. In the DYMET® coating process, compressed air is heated and forced through a supersonic nozzle. 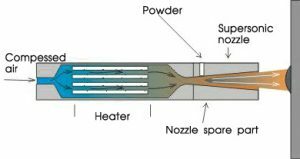 Powder is fed into the resulting supersonic air jet, which accelerates the powder particles and deposits them onto the target substrate. The powders are comprised of metals, alloys or mixtures of metal and ceramic particles. The treated surface can be either eroded or coated with necessary metal compositions depending on the operating mode of the device. Most traditional thermal spray coating methods imply deposition of material particles at high temperatures, usually above the melting point of the material being deposited. In gas-dynamic spray technology (which can be practically referred to as ‘metal “growing”) this condition is not necessary. Deposition takes place by means of solid particles impacting the substrate at very high velocities. In the DYMET® series of devices, the acceleration of particles to necessary velocities is accomplished via a supersonic air jet. This equipment has no analogues in traditional coating methods. Coatings created with DYMET® technology are free of the majority of disadvantages common to other metal deposition methods. They also possess a number of additional technological, economic, and ecological advantages. This makes the technology attractive to manufacturing enterprises and allows its effective application in a wide range of metal deposition tasks. equipment can be used in field conditions. The high versatility and excellent quality of DYMET® coatings have been confirmed many times by both laboratory tests and industrial applications. Some metal deposition tasks were practically impossible to accomplish until the arrival of DYMET® technology.